No complaint listed. Closed complaint. Neighbors driveway drain pipe is still clogged !! What did you all do? No issue was listed when this complaint was received. Therefore the complaint was closed. If there is an issue that needs to be reported, please clearly detail what the issue/violation is and we will investigate. Drain filler in so it’s affecting the water flow from other properties. Thank you for contacting us. Your complaint is not clear. Can you please clarify the violation you are reporting. Once we have a description of the problem we will investigate. Thank you. The drain has been filled in by the new property owner and it’s affecting the flow of the water from properties further down the street. Anything happening with this issue? 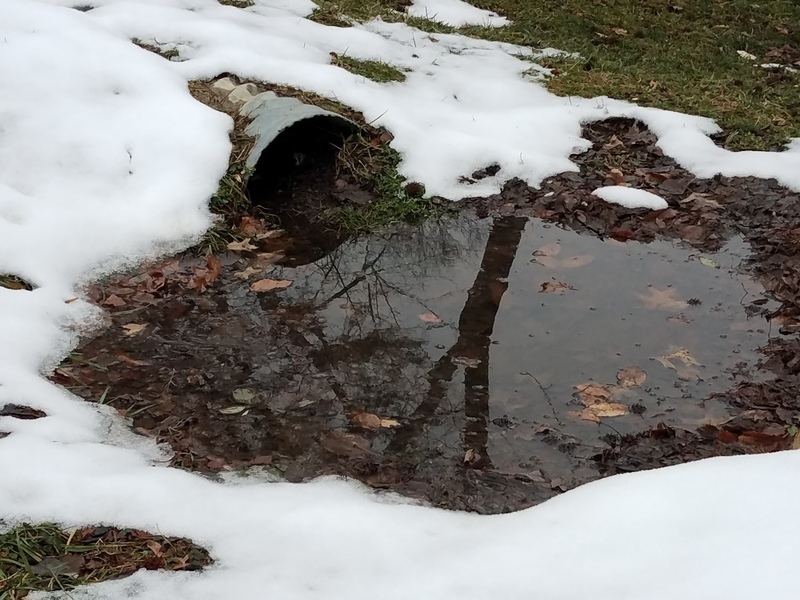 Storm water drainage pipe has not been cleared out in at least a year. Storm water drains down into yards every time it rains. Takes days to go down afterward. Manhole in road is sinking at same location. Reported before, road was marked months ago. Please fix!! Saw that the hole was kind of filled in yesterday but that does not address the entire issue. Hopefully as soon as it warms up a bit, the entire issue will be properly addressed. Another pic showing awful drainage at same location. Takes days to go down & there's constant runoff into nearby yards. This is an issue that was reported on 6/19/18 and supposed to be fixed on three separate occasions, per I&P, the most recent being 10/23/18. Toby at 833 Selby Blvd is illegally discharging his sump pump, and has been cited on 6/29/18 via I&P, the gross negligence being demonstrated by Toby at 833 Selby is causing costly damage that the county will be responsible for if they don’t do their part and hold the homeowner accountable, something Anne Arundel county has yet to do. Ranthony Cotton incorrectly closed this once and was made to reopen it because he looks out for his fellow county workers, like Toby. I repeat, nothing has been fixed on this. I request that someone other than Mr. Cotton please inspect this because he’s already incorrect closed an active issue that has caused months worth of delays because of his error, an error no one has explained despite dozens of phone calls to get clarification. This sitting water is causing massive amounts of bugs and it’s grotesque and there has been sitting water for months, MONTHS, and his reaction is to close it? That was unacceptable and gave Toby months longer for something that has been causing damage to two separate properties. It was reopened yet I&P refuses to hold the homeowner accountable. The issue is causing flooding at 835 & 837 Selby Blvd. Please FINE the homeowner until they fix the problem they were cited for 4 months ago. I don’t know where else to turn other than legal action against the county and the homeowner, something I shouldn’t have to do - why won’t the county hold this county worker responsible? Please see https://seeclickfix.com/issues/4847115 for the previous interactions concerning this months old problem. My next course of action is to partner with a local media affiliate and go over my months worth of notes that chronicle the clear bias the county has handled this with, protecting a police officer from being held accountable is absolutely what’s happening and that’s unacceptable. Case is active and open, 311 will be closed. It was supposed to be fixed on 10/23, it’s past that date and not fixed. Unless Toby Fominaya, the homeowner at 833 Selby Blvd, received the county employee special AGAIN and had the date being pushed back yet again, in which case, what’s the new date? The homeowners at 835 and 837 Selby, whom have been having their properties flooded by the homeowner at 833 Selby Blvd, since the county first ticketed Toby on 6/29, would love to finally see some semblance of accountability on the counties end, not just the date being pushed back now for the FOURTH time. Clearly the county is playing defense for a county worker, why is that? The resident at 833 Selby Blvd is illegally dumping water onto three neighbors properties. He continues to get a pass because he’s a county worker, the driveway pictured was dry this morning (I have video evidence I’ve been collecting for a legal battle against the county and the homeowner) and it’s not rained today - Toby Fominaya is illegally dumping water, again, after being asked by the county to stop. But you folks at the county refuse to do you job and follow-up in an appropriate fashion. Please, someone needs investigate this ASAP and hold this serial violator to account, multiple people have filed complaints but the county continues to play defense for this violator - the county continues to allow this violator, who feels he’s above the law, to break the clear county ordinances that the rest of us must follow. Why does the county continue to allow one of their own to destroy multiple peoples properties with no recourse? It is insane Anne Arundel county is still allowing this, they’re normally on top of situations like this. This guy must know someone at I&P, that is the only thing that makes any sense. You should go to their county office, it’s clear they ignore the online complaints against this guy. File one in person and take some of your evidence you mentioned, they may finally do something. Good luck. I’ve reported him too because I have to walk by this mess everyday and it’s certainly out of code, that’s what’s mind boggling to me - anyone looking at this can see that clear as day. Illegal drainage discharge, this was dry this morning and it hasn’t rained at all since, this individual is illegally dumping his sump pump discharge into three neighbors yards. 837 Selby Blvd, 835 Selby Blvd and the house directly behind 833 Selby on Fourth Ave. All three homeowners being flooded out by 833 Selby have filed individual complaints with the county NUMEROUS times and the county has acknowledged the resident at 833 Selby is not following the ordinances governing the dumping of water, but because a county worker is responsible, it’s continually ignored. I’ll post another complaint, with an updated picture in a hour once the affected area shown starts to fill up, at it has for the past year, ILLEGALLY into the yard two houses down, due to the aforementioned illegally installed drain. PLEASE MAKE THEM FIX THIS TO CODE, this is getting ridiculous. This has been ongoing for a year and the resident at 833 Selby Blvd has received numerous warnings and they refuse to fix it to code. Please hold the resident of 833 to account, this is ruining three separate neighbors yards and the county continues to ignore it. This is unacceptable and I will be taking legal action against the county if they do not act immediately. I have already obtained legal counsel and what the county is doing is illegal, please do your respective jobs and make this situation right. This water has been here for several months, or at least continually flowing from 833 Selby Blvd’s ill installed sump pump discharge pipe, this guy thinks he’s a contractor and continues to destroy two neighbors yards due to his terrible workmanship in the illegal installation of the drain. This needs to be fixed by a professional and the county must (PLEASE!) hold this resident accountable for knowingly ignoring the exact thing they’ve been cited for numerous times. Yes, the resident at 833 Selby Blvd has been cited numerous times for the exact infraction, they’re a serial offender. I thought any sump pump discharge installs or changes needed a permit? I know definitively the residents at 833 Selby did not obtain any permits to alter it, but that’s just one of the many ordnance’s they’re ignoring with seemingly zero enforcement from the counties end. According to county ordinance governing the installation of these drains, they’re supposed to be farther from the property line than this one is. It’s practically on the property line, after it was discharging directly on the road, illegally, prior. Now he’s dug up the neighbor’s yard who’s being affected the most, the one that has the drain practically on their property line, in an effort to illegally flood them and a neighboring home, or to put the water on the road, where the county advised it doesn’t belong since there is no drain there. The county either needs to add the appropriate drains and infrastructure or ensure people whom are demonstrating gross negligence are swiftly held to account, not addressing flooding can cause structural damage to the homes in which the county could be responsible for if the reported infractions were not properly addressed and documented. We were told when the houses were built there would be swails installed around the corner of Selby and Fourth that would NEGATE all these issues, and that’s why the homes were approved here to begin with. The fact there is no drains, is absolutely the cause of this. Please, if you’re not going to hold them accountable at 833 Selby, at least add the needed infrastructure to stop the flooding. Since you’re probably not going to install the proper infrastructure, please address this resident whom has been cited numerous times. It gets fixed for a week or two at a time, as has been the case over the years this violator has been flooding several neighbors yards. I count three separate homes this guy is flooding over the past several year, at least we’re down to only two yards he’s flooding now. Is the reason nothing ever happens is because there’s an Anne Arundel county police SUV in the driveway? It’s pretty bad when this guy feels bold enough to TRENCH a neighbors yard late at night so the water continues to flood, as opposed to follow the ordinances like the rest of the county. The resident at 833 Selby has taken a shovel and dug up parts of the neighbors yard in an effort to negate the amount of the illegally dumped water from 833’s yard to 835 Selby’s yard, the water originated from 833 Selby and belongs there and would drain properly there if the county would hold him to account. Unfortunately due to the fact the county refuses to enforce the ordinances on the books, multiple people are having their yards flooded. What does this say to everyone else? We’re absolved of any accountability if we’re police? That is setting an awful precedent, if true. The 800lb gorilla in the room is: He wouldn’t feel emboldened and the need to trench a neighbors yard if the infrastructure was appropriate, as the builder promised per the initial approval of the building of 833, 835 & 837 Selby. I hope someone finally does something. A deeper question is, why wasn’t the builder responsible for following the county code that has lead to this? This is still unresolved. The resident at 833 Selby Blvd is continuously flooding other neighbors yards, despite being warned numerous times to stop, he’s currently flooding the house behind him on 4th Ave. Meanwhile, in Selby on the Bay, I&P continues to ignore the infractions because a county worker is responsible. Hopefully some semblance of accountability is on the horizon. Large, deep pothole where Woodlawn St and Hillside Avenue intersect. Full of water. Thank you for contacting the Department of Public Works, Bureau of Highways regarding your pothole concern. Work order # 19401202 has been created and assigned to the Southern District Road Operations for investigation and repair. Should you need additional information on this issue please contact (410)222-1933.